After releasing an EP and two full-lengths on Chicago-indie Sugar Free Records - 1997's Nobody's Favorite EP, 1998's Every Night Fight for Your Life, and 2000's Kiss It Goodbye -- his label dropped him. 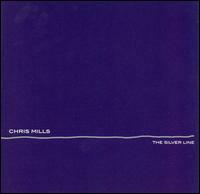 Chicago-based singer-songwriter Chris Mills wasn't fazed, though. He decided to start his own label, Powerless Pop Records, to release his new record, The Silver Line. "By the time I started work on The Silver Line my relationship with Sugar Free had ended, and they have since sort of dropped off the radar. But I wasn't thinking that I was going to start my own label," explains Mills. "I just went into the studio to make the kind of record I wanted to make without worrying about what label I was going to find to put it out. But once it was done I realized that I wasn't going to be willing to put it in the hands of someone else. I talked with a few labels but it didn't seem like they were going to be able to put any more resources into the release than I would be able to come up with on my own. So I went and got a bank loan and then started to think about starting a label. So it wasn't really a reaction to any problems I may or may not have had with Sugar Free, but more the end result of realizing that it would be possible to do just as good a job on my own." For most people, making the leap from singer-songwriter to songwriter/label president would be daunting, but Mills takes it all in stride, shrugging it off as nothing more than something he saw as a necessity to get his music out there. "There are drawbacks," confesses Mills. "But for the most part, it's pretty great. I get to see the direct result of the work that I do. I know where the records are going and who's buying them and how the finances work, which are a lot of pieces of the puzzle that I wasn't really aware of when I was on a label. It is definitely a lot of work, but I do love the control. I feel less pressure to be commercially successful, because I'm not playing with anybody else's money. But at the same time I'm selling more records than I ever have, and part of that is probably because I don't have to look after a full stable of artists -- at least for now -- and because I'm selling something that I have a personal and emotional stake in." Whereas Mills' earlier releases are best described as roots-oriented and Americana-based, The Silver Line finds Mills fully delving into the sugary-sweet pop hinted by earlier outings. When asked what made him want to further explore pop and expand beyond his Americana writings of past, Mills is quick with an answer. "I generally don't tailor my writing to any particular style. I think that well-written songs can be done any number of ways, and while I'm in the studio, I try and find the best way that I can to present the songs," he explains. "I try to figure out how I can combine my sensibilities with what is best for that particular song. "On this record, I tried doing several of the tracks a number of different ways before we found the best way to lay them down. We had to cut 'I Could Not Stand To See You' three different times before we got it right. So, at least for me, writing is just the beginning. But once I've got a solid foundation, I can start interpreting, either in rehearsal or in the studio, and hopefully come out with something that connects the listener to the song." Mills sees The Silver Line not necessarily as a new direction for himself, but a continuation of where he left off with Kiss It Goodbye, further explaining the more pop-oriented focus of the record as a natural progression. "I see each record as a continuation of the last. I try and evolve and expand on what I've done before, while preserving a certain thematic unity. Even if you go back to my first EP, it resonates with what's going on in The Silver Line. But at the same time, hopefully, each new record is deeper and more complex lyrically, musically and emotionally than the one that came before it. I've always been fascinated with human nature and the ways that people interact, especially romantically. And hopefully I'll be able to continue to connect with people while continuing to find news ways (at least for me) to explore those themes that I find most compelling." Mills then discusses the making of The Silver Line. "I love the more orchestral stuff," he says of the record. "Other than that, it was great getting the chance to work with so many awesome musicians. I'm really proud of the fact that musicians I respect so much are willing to come in and put everything they've got into what I'm doing. "I think the record feels really good. Since we recorded all the basic tracks and vocals live I think Brian Deck (engineer, producer) was able to capture a sort of looseness in the playing that's missing from a lot of records these days. Something a little more reminiscent of say The Basement Tapes or Tonight's the Night or Sister Lovers, those records where it's obvious that these guys are really comfortable playing together and they just let the tape roll. You always wish you had more time, or maybe more money to work on something. But honestly, I'm really happy with the way things turned out. I think for the first I've been able to make the record I that wanted to make, without having to worry about a lot of the constraints or hang-ups I've felt in the past." With no pressures from labels, no outside influences, basically nothing more than his songs and his passion, Mills created the record he wanted to create, going into the studio to have fun and do things his way, worry-free and with no expectations. The question arises, however, if all these things made the record an easy record for Mills to make. "I don't think I would call it an easy record to make, but it definitely wasn't as difficult as Kiss It Goodbye," admits Mills. "On the last record I almost had a complete mental break down. I would wake up at four in the morning and chain smoke until the sun came up worrying about this track or that vocal or whatever. So this time I tried to go in with more of a plan, more focus, and more preparation and I think that ultimately it paid off. I definitely put more work into The Silver Line, but as a whole the experience was a lot less stressful." Bringing the conversation back to the idea of running his own label and taking control of every aspect of his music, Mills says, "I also think that a lot of that had to do with not working for a label. I wasn't trying to please anyone." Mills doesn't seem like the type of artist that is a control freak. The type that sits over the shoulder of every backing musician to make sure they're playing their parts exactly how he wants them, going as far as to do them himself because he doesn't believe they can do anything right. However, he has learned that sometimes the best way to do things is by doing it yourself. That is why he started his own label, and why he books himself now. "I'm booking my shows myself, for the first time in a long time," he tells me. "Hopefully I've got it under control now." Learning as he went, his main focus was getting the record recorded. Then he set his mind on getting the record label up and running. Now that those two pieces of the puzzles are in place, he is focusing his energy on learning how to book himself. The more he books, the better he gets at it (like anything), and hopefully, according to him, he'll feel confident to book a tour in awhile to support The Silver Line.